We’ve had a few too many snow days lately. And when we’re stuck inside, we tend to head to the kitchen and BAKE. On Friday (snow day #2 of our 5 day weekend), my 14 year old daughter decided she’d like to make some cupcakes. I tried to convince her that if she was going to go through the effort of making a bunch of cupcakes, then she might as well try some new flavors and variations. While she wanted to concentrate on the decorating, I jumped in and came up with my own variation of spice cake cupcakes. And, OH MY! They were better than I could have imagined. My oldest daughter even commented, after eating her first cupcake, that they were better than the fancy cupcakes you get at the cupcake bakeries. They were so delicious that I would have eaten them for breakfast, lunch and dinner if I hadn’t run out of them (and thank goodness I did!). 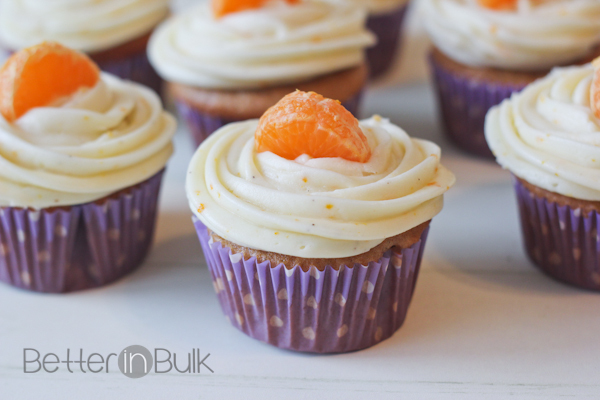 I love that these cupcakes start with a simple base – aren’t cake mix hacks great? Add spice cake mix to a large mixing bowl. Add orange juice, oil, eggs, ginger, and orange zest and mix just until combined. Scoop batter into prepared cupcake pan (either spray cupcake pan with non-stick spray or use cupcake liners). Bake for 18-20 minutes at 350°. Remove from oven and let cool in the pan. To prepare frosting: Beat cream cheese and butter together until creamy and light. Add powdered sugar gradually and continue beating. Add vanilla, ginger, and zest and best until smooth. Frost cooled cupcakes and enjoy! 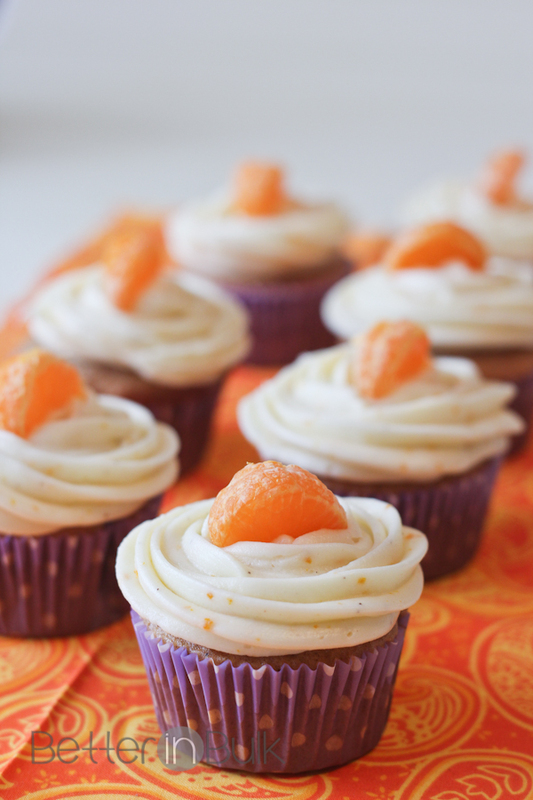 *I added slices of mandarin oranges on top of each cupcake just for fun. I think I need to make another batch of these. Have I told you how delicious they were and how fast they disappeared? Now let’s see what you’ve been cooking! I’m teaming up once again with From Val’s Kitchen and This Mama Loves for our weekly recipe linky. Since mine is a year-end favorite recipe round up, I would LOVE to see your favorite dishes from the past year. Please post the direct link to your recipe (not your blog URL) and the name of your recipe below. Then be sure to visit again next Monday for a new recipe and another chance to link up! © 2014 – 2015, Food Fun Family. All rights reserved. Yummy these look delicious and I bet nobody would think you started with a box mix. I like to make candied orange peel from organic oranges (or tangerines, etc.) 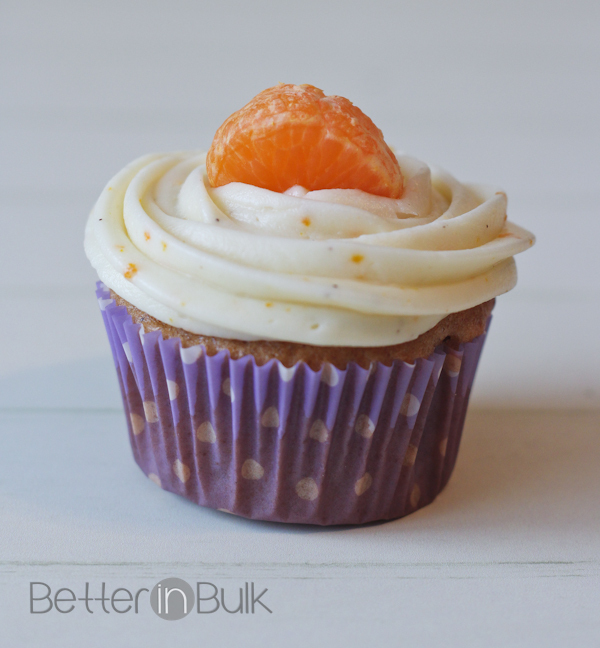 and I’d use a sliver of that instead of fresh orange on the frosting. Sometimes I chop the candied peel and add it to the batter or frosting. I *LOVE* orange treats, so this is pure goodness to me! Love the look of the orange with the purple liners too. These look absolutely delicious. The cream cheese frosting has me drooling. Thanks so much for sharing on Inspire Me Wednesday. Featuring you in next week’s issue. Yay! Thank you! 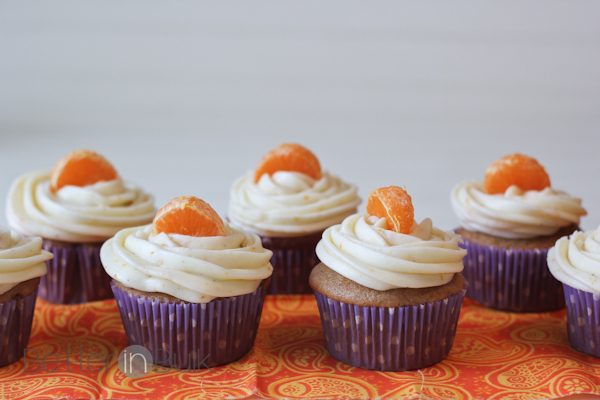 The orange cream cheese frosting STILL has me drooling. Seriously some of the best frosting I’ve ever made! We haven’t had any snow days this winter but my daughter sure does love to bake cupcakes. these look so cute and sound oh so yummy! 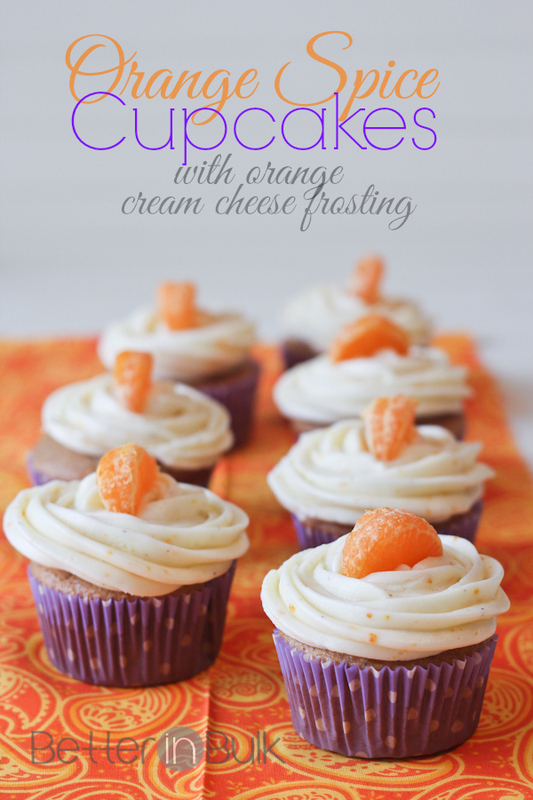 I love the flavor orange and cream cheese frosting. Will have to try these out. I definitely wouldn’t wait for the next snow day before making these again. :) It was just a nice excuse to spend the day in the kitchen baking together! So cute! I love the contrast between the orange and the purple wrapper. Thanks for the recipe! I’ve never had a dessert with orange and spice combined. it sounds yummy, and it looks great! It was a lucky accident. I’m so happy with how they turned out!